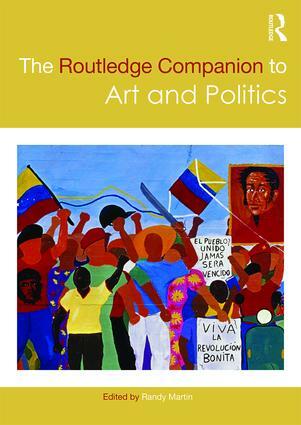 The Routledge Companion to Art and Politics offers a thorough examination of the complex relationship between art and politics, and the many forms and approaches the engagement between them can take. The contributors - a diverse assembly of artists, activists, scholars from around the world – discuss and demonstrate ways of making art and politics legible and salient in the world. As such the 32 chapters in this volume reflect on performing and visual arts; music, film and new media; as well as covering social practice, community-based work, conceptual, interventionist and movement affiliated forms. Randy Martin has assembled a collection that ensures that readers will come away with a wider view of what can count as art and politics; where they might find it; and how it moves in the world. The diversity of perspectives is at once challenging and fortifying to those who might dismiss political art on the one hand as not making sufficient difference and on the other to those embracing it but seeking a means to elaborate the significance that it can make in the world. The Routledge Companion to Art and Politics brings together a range of issues and approaches and encourages critical and creative thinking about how art is produced, perceived, and received. "The Routledge Companion to Art and Politics is well suited for libraries working with artists, scholars, curators of contemporary art, and gallery professionals. Summing Up: Recommended." Randy Martin was Professor and Chair of Art and Public Policy and founding director of the graduate program in Arts Politics at the Tisch School of the Arts, New York University. He was author of books on the politics of dance, theatre, war, finance, and education. Routledge Art History and Visual Studies Companions offer thorough, high-quality surveys and assessments of the major topics in the fields of art history and visual studies. All entries in each companion are specially commissioned and written by leading scholars in the field. Clear, accessible, and cutting-edge, these companions are the ideal resource for advanced undergraduates, postgraduate students, and researchers alike.